For other uses, see Kaganovich (disambiguation). This name uses Eastern Slavic naming customs; the patronymic is Moiseyevich and the family name is Kaganovich. Lazar Moiseyevich Kaganovich (Russian: Ла́зарь Моисе́евич Кагано́вич; 22 November [O.S. 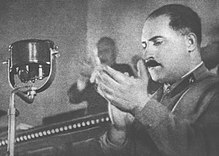 10 November] 1893 – 25 July 1991) was a Soviet politician and administrator and one of the main associates of Joseph Stalin. He is known for helping Stalin seize power, for his role in the Soviet famine of 1932–33 in Ukraine, and for his harsh treatment and execution of those deemed threats to Stalin's regime. At his death in 1991, he was the last surviving Old Bolshevik. The Soviet Union itself outlived him by a mere five months. 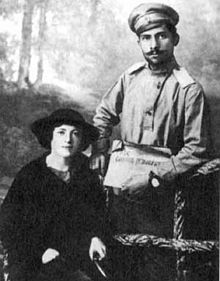 Kaganovich was born in 1893 to Jewish parents in the village of Kabany, Radomyshl uyezd, Kiev Governorate, Russian Empire (now named Dibrova, Poliske Raion, Kiev Oblast, Ukraine). Early in his political career, in 1915, Kaganovich became a Communist organizer at a shoe-factory where he worked. Around 1911, he entered the Bolshevik party (his older brother Mikhail Kaganovich had become a member in 1905). In 1915, Kaganovich, living in Kiev, was arrested and briefly sent back to Kabany. During March and April 1917, he served as the Chairman of the Tanners Union and as the vice-chairman of the Yuzovka Soviet. In May 1917, he became the leader of the military organization of Bolsheviks in Saratov, and in August 1917, he became the leader of the Polessky Committee of the Bolshevik party in Belarus. During the October Revolution of 1917 he led the revolt in Gomel. In 1918 Kaganovich acted as Commissar of the propaganda department of the Red Army. From May 1918 to August 1919 he was the Chairman of the Ispolkom (Committee) of the Nizhny Novgorod gubernia. In 1919–1920, he served as governor of the Voronezh gubernia. The years 1920 to 1922 he spent in Turkmenistan as one of the leaders of the Bolshevik struggle against local Muslim rebels (basmachi), and also commanding the succeeding punitive expeditions against local opposition. In May 1922, Stalin became the General Secretary of the Communist Party and immediately transferred Kaganovich to his apparatus to head the Organizational Bureau or Orgburo of the Secretariat. This department was responsible for all assignments within the apparatus of the Communist Party. Working there, Kaganovich helped to place Stalin's supporters in important jobs within the Communist Party bureaucracy. In this position he became noted for his great work capacity and for his personal loyalty to Stalin. He stated publicly that he would execute absolutely any order from Stalin, which at that time was a novelty. In 1924, Kaganovich became a member of the Central Committee. From 1925 to 1928, Kaganovich was the First Secretary of the Communist Party of the Ukrainian SSR. He was given the task of "ukrainizatsiya" – meaning at that time the building up of Ukrainian communist popular cadres. He also had the duty of implementing collectivization and the policy of economic suppression of the kulaks (wealthier peasants). He opposed the more moderate policy of Nikolai Bukharin, who argued in favor of the "peaceful integration of kulaks into socialism". In 1928, due to numerous protests[by whom?] against Kaganovich's management, Stalin was forced to transfer Kaganovich from Ukraine to Moscow, where he returned to his position as a Secretary of the Central Committee of the Communist Party, a job he held until 1939. As Secretary, he endorsed Stalin's struggle against the so-called Left and Right Oppositions within the Communist Party, in the hope that Stalin would become the sole leader of the country. In 1933 and 1934, he served as the Chairman of the Commission for the Vetting of the Party Membership (Tsentralnaya komissiya po proverke partiynykh ryadov) and ensured personally that nobody associated with anti-Stalin opposition would be permitted to remain a Communist Party member. In 1934, at the XVII Congress of the Communist Party, Kaganovich chaired the Counting Committee. He falsified voting for positions in the Central Committee, deleting 290 votes opposing the Stalin candidacy. His actions resulted in Stalin's being re-elected as the General Secretary instead of Sergey Kirov. By the rules, the candidate receiving fewer opposing votes should become the General Secretary. Before Kaganovich's falsification, Stalin received 292 opposing votes and Kirov only three. However, the "official" result (due to the interference of Kaganovich) saw Stalin with just two opposing votes (Radzinsky, 1996). In 1930, Kaganovich became a member of the Soviet Politburo and the First Secretary of the Moscow Obkom of the Communist Party (1930–1935). He later headed the Moscow Gorkom of the Communist Party (1931–1934). He also supervised the implementation of many of Stalin's economic policies, including the collectivization of agriculture and rapid industrialization. In the 1930s, Kaganovich, along with project managers Ivan Kuznetsov and, later, Isaac Segal, organized and contributed greatly to the building of the first Soviet underground rapid-transport system, the Moscow Metro, known as Metropoliten imeni L.M. Kaganovicha after him until 1955. During this period, he also supervised the destruction of many of the city's oldest monuments, including the Cathedral of Christ the Saviour. In 1932, he led the suppression of the workers' strike in Ivanovo-Voznesensk. Kaganovich (together with Vyacheslav Molotov) participated with the All-Ukrainian Party Conference of 1930 and were given the task of implementation of the collectivization policy that caused a catastrophic 1932–33 famine (known as the Holodomor in Ukraine). Similar policies also inflicted enormous suffering on the Soviet Central Asian republic of Kazakhstan, the Kuban region, Crimea, the lower Volga region, and other parts of the Soviet Union. As an emissary of the Central Committee of the Communist Party, Kaganovich traveled to Ukraine, the central regions of the USSR, the Northern Caucasus, and Siberia demanding the acceleration of collectivization and repressions against the Kulaks, who were generally blamed for the slow progress of collectivization. Attorney Rafael Lemkin in his work The Soviet Genocide in Ukraine tried to present the fact of Holodomor to the Nuremberg trials as a genocide of a totalitarian regime. On 13 January 2010, Kiev Appellate Court posthumously found Kaganovich, Postyshev, Kosior, Chubar and other Soviet Communist Party functionaries guilty of genocide against Ukrainians during the catastrophic Holodomor famine. Though they were pronounced guilty as criminals, the case was ended immediately according to paragraph 8 of Article 6 of the Criminal Procedural Code of Ukraine. The importance of the case is its historical aspect that legally explains the particularity of that historical event[clarification needed]. By New Years Day, the Security Service of Ukraine had finished pre-court investigation and transferred its materials to the Prosecutor General of Ukraine. The materials consist of over 250 volumes of archive documents (from within Ukraine as well as from abroad), interviews with witnesses, and expert analysis of several institutes of National Academies of Sciences. Oleksandr Medvedko, the Prosecutor General, confirmed that the material gives clear evidence of the genocide occurring in Ukraine. From 1935 to 1937, Kaganovich worked as Narkom (Minister) for the railways. Even before the start of the Great Purges, he organized the arrests of thousands of railway administrators and managers as supposed "saboteurs". From 1937 to 1939, Kaganovich served as Narkom for Heavy Industry. During 1939–1940, he served as Narkom for the Oil Industry. Each of his assignments was associated with arrests in order to improve discipline and compliance with Stalin's policies. In all Party conferences of the later 1930s, he made speeches demanding increased efforts in the search for and prosecution of "foreign spies" and "saboteurs". For his ruthlessness in the execution of Stalin's orders, he was nicknamed "Iron Lazar". During the period of the Great Terror, starting in 1936, Kaganovich's signature appears on 188 out of 357 documented execution lists. One of many who perished during these years was Lazar's brother, Mikhail Kaganovich, who was People's Commissar of the Aviation Industry. On 10 January 1940 Mikhail was demoted to director of aviation plant 124 in Kazan. In February 1941, during the 18th Conference of the Communist Party, Mikhail was warned that if the plant missed its quotas he would be eliminated from the Party. On 1 June 1941 Stalin mentioned to Lazar that he had heard that Mikhail was "associating with the right wing". Lazar reportedly did not speak in the defence of his brother to Stalin, but did notify him by telephone. The same day Mikhail committed suicide. During his time serving as Railways Commissar, Kaganovich participated in the murder of 36,000 people by signing death lists, in fact Kaganovich had exterminated so many railwaymen that one official called to warned that one line was entirely unmanned. During World War II (known as the Great Patriotic War in the USSR), Kaganovich was Commissar (Member of the Military Council) of the North Caucasian and Transcaucasian Fronts. During 1943–1944, he was again the Narkom for the railways. In 1943, he was presented with the title of Hero of Socialist Labour. From 1944 to 1947, Kaganovich was the Minister for Building Materials. In 1947, he became the First Secretary of the Ukrainian Communist Party. From 1948 to 1952, he served as the Chairman of Gossnab (State Committee for Material-Technical Supply, charged with the primary responsibility for the allocation of producer goods to enterprises, a critical state function in the absence of markets), and from 1952 to 1957, as the First Vice-Premier of the Council of Ministers. He was also the first Chairman of Goskomtrud (State Committee for Labour and Wages, charged with introducing the minimum wage, with other wage policy, and with improving the old-age pension system). Until 1957, Kaganovich was a voting member of the Politburo as well as the Presidium. He was also an early mentor of the eventual First Secretary of the Communist Party Nikita Khrushchev, who first became important as Kaganovich's[Moscow City deputy during the 1930s. In 1947, when Khrushchev was dismissed as the Party secretary of Ukraine (he remained in the somewhat lesser "chief of government" position), Stalin dispatched Kaganovich to replace him until Khrushchev was reinstated later that year. Kaganovich was a doctrinaire Stalinist, and though he remained a member of the Presidium, he quickly lost influence after Stalin's death in March 1953. In 1957, along with fellow devoted Stalinists as well as other opponents of Khrushchev, Molotov, Dmitri Shepilov and Georgy Malenkov (the so-called Anti-Party Group), he participated in an abortive party coup against his former protégé Khrushchev, whose criticism of Stalin had become increasingly harsh during the preceding two years. As a result of the unsuccessful coup, Kaganovich was forced to retire from the Presidium and the Central Committee, and was given the job of director of a small potash works in the Urals. In 1961, Kaganovich was completely expelled from the Party and became a pensioner living in Moscow. His grandchildren reported that after his dismissal from the Central Committee, Kaganovich (who had a reputation for his temperamental and allegedly violent nature) never again shouted and became a devoted grandfather. In 1984, his re-admission to the Party was considered by the Politburo, alongside that of Molotov. At the time of Molotov's death in November 1986, he was refused access to his friend's funeral because of his severe state of dementia. Kaganovich survived to the age of 97, dying in 1991, just before the events that resulted in the end of the USSR. He is buried in the famed Novodevichy Cemetery in Moscow. In 1987, American journalist Stuart Kahan published a book entitled The Wolf of the Kremlin: The First Biography of L.M. Kaganovich, the Soviet Union's Architect of Fear (William Morrow & Co). In the book, Kahan made a series of claims about Kaganovich's working relationship with Stalin and his activities during the Ukrainian famine, and claimed to be Kaganovich's long-lost nephew. He also claimed to have interviewed Kaganovich personally and stated that Kaganovich admitted to being partially responsible for the death of Stalin in 1953 (supposedly by poisoning). A number of other unusual claims were made as well, including that Stalin was married to a sister of Kaganovich (supposedly named "Rosa") during the last year of his life and that Kaganovich (who was raised Jewish) was the architect of anti-Jewish pogroms. After The Wolf of the Kremlin was translated into Russian by Progress Publishers, and a chapter from it printed in the Nedelya (Week) newspaper in 1991, remaining members of Kaganovich's family composed the Statement of the Kaganovich Family in response. The statement disputed all of Kahan's claims. Rosa Kaganovich, who the Statement of the Kaganovich Family says was fabricated, was referenced as Stalin's wife in the 1940s and 1950s by Western media including The New York Times, Time and Life. Kaganovich is responsible for the use of the "eggs and omelette" metaphor in reference to the Great Terror ("Why wail over broken eggs when we are trying to make an omelette! "), a usage commonly attributed to Stalin himself. The expression was first used in 1742 in reference to a French Royalist counter-revolution. According to Time magazine and some newspapers, Lazar Kaganovich's son Mikhail (named after Lazar's late brother) married Svetlana Dzhugashvili, daughter of Joseph Stalin on 3 July 1951. Svetlana in her memoirs denies even the existence of such a son. ^ Garthoff, Raymond L. (1994). The Great Transition: American-Soviet Relations and the End of the Cold War. Washington, DC: Brookings Institution. p. 461, n30. ISBN 0-8157-3060-8. ^ Compare: "Kaganovich, Lazar Moiseyevich". Jewish Virtual Library. The American-Israeli Cooperative Enterprise. 2013. Retrieved 2016-05-23. Born in Kiev province, Kaganovich joined the Communist Party in 1911 [...]. [...] For a number of years he was the only Jew to occupy a top position in the Soviet leadership. ^ Rees, E. A. (2013-10-15). Iron Lazar: A Political Biography of Lazar Kaganovich. Anthem Press. ISBN 9781783080571. ^ Lemkin, Raphael (2009). "Soviet Genocide in the Ukraine (reprint of 1951 article)". Holodomor: Reflections on the Great Famine of 1932–1933 in Soviet Ukraine. Kingston: Kashtan Press. ^ Simon Sebag Montefiore. Stalin: The Court of the Red Tsar. p. 210. ^ editors (1 July 2016). "12 July 1984". Life – July 14, 1941. p. 19: "A sister Rosa first lived with Stalin, then after the suicide of his second wife is supposed to have married Stalin"
Life – March 29, 1943. p. 40: "His sister Rosa is supposedly married to Stalin"
Time – April 18, 1949: "Lazar Kaganovich, who is Stalin's brother-in-law"
Time – July 23, 1951: "Lazar Kaganovich, long time politburo member and Stalin's brother-in-law"
Life – March 16, 1953. p. 22: "Kaganovich, the brilliant and energetic Jew, Stalin's brother-in-law"
Life – April 13, 1953. p. 168: "Kaganovich (a member of the Politburo and brother of Stalin's third wife)"
Time – September 7, 1953: "Lazar Kaganovich (Stalin's brother-in-law)"
Time – February 7, 1955 – "Lazar M. Kaganovich, wartime commissar for transport, reputedly Stalin's brother-in-law"
Youngstown Vindicator – March 7, 1953: "Rosa Kaganovich"
Milwaukee Sentinel – June 11, 1960: "Rosa Kaganovich"
The New York Times – July 27, 1991: "Kaganovich's sister, Rosa"
^ Vuolo, Mike (2013-12-30). "Let's Resolve in the New Year to Stop Using That Expression About Breaking Eggs and Making Omelets". Slate. ISSN 1091-2339. Retrieved 2016-03-23. ^ Alliluyeva, Svetlana (1969). Only One Year. Harper & Row. p. 382. Wikimedia Commons has media related to Lazar Kaganovich.